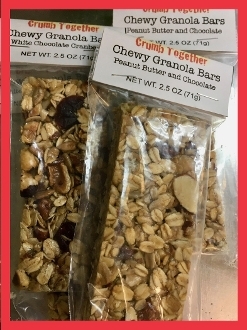 Uncle Tony makes his own chewy granola bars. They're delicious! Previously only available in the Eugene, OR store - now available for shipping across the US. Choose from PEANUT BUTTER & CHOCOLATE or WHITE CHOCOLATE & CRANBERRY or MIX THEM TOGETHER. Shipping in packages of SIX, we offer 3 different options.